on the iPad, the iPhone, and the iPod touch. as well as future enhancements. with the same rhythm as regular typing. and corrects incorrect tone marks for you! from a pain into a pleasure. 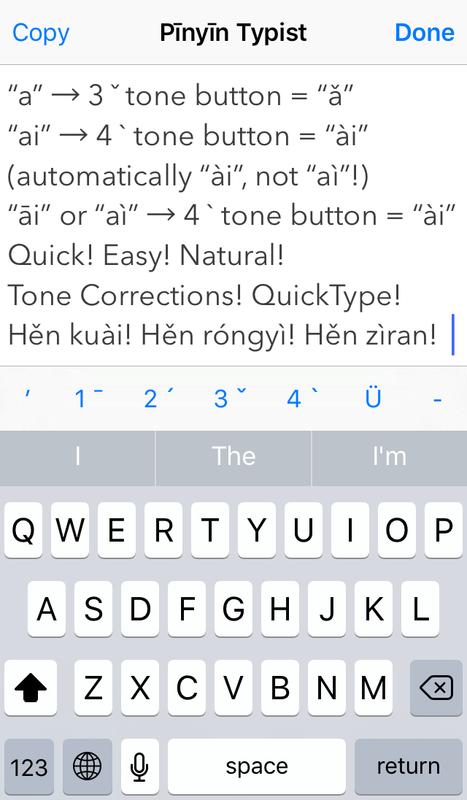 Pīnyīn makes reading and writing Mandarin Chinese as quick and easy as it ought to be, and Pīnyīn Typist makes typing real, professional-quality Pīnyīn with tone marks as quick and easy as it ought to be. Pīnyīn Typist was the first iOS Pīnyīn typing app, and it’s still the best. 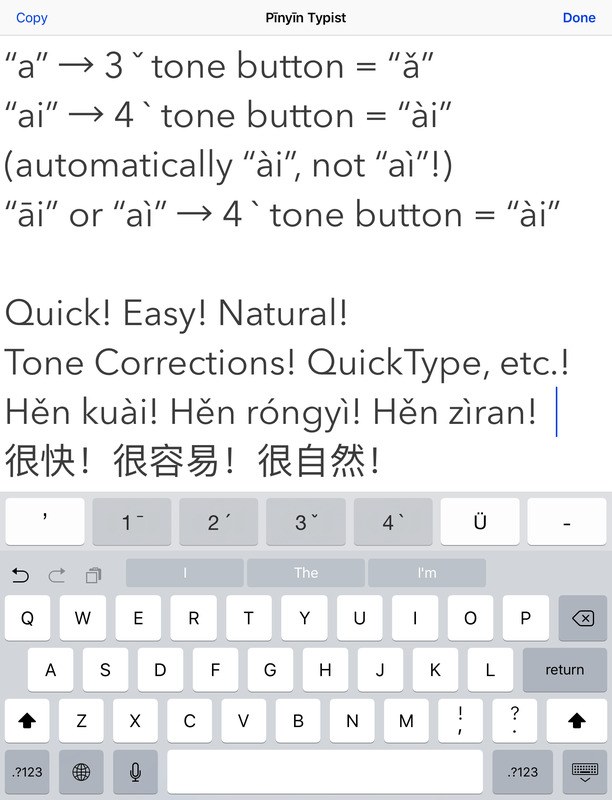 Pīnyīn Typist launches quickly, so with it on your iPad, iPhone, or iPod touch, you can quickly, easily, and naturally type Pīnyīn text to write down anything you hear or want to say in Mandarin, just about anytime the need arises or inspiration strikes. Pīnyīn Typist’s nice, big tone mark, Ü, hyphen, and apostrophe buttons are all on the main screen, and they work with just a simple tap—no waiting, holding and sliding, or switching keyboards needed. You just type normally and naturally, quickly and easily producing professional-quality, typographically correct Pīnyīn. Pīnyīn Typist even puts the tone marks over the right vowels for you, and it also lets you correct incorrect tone marks without having to backspace and retype! Pīnyīn, with its dastardly, diabolical diacritical tone marks, has historically been a pain to type into computing devices. So, Pīnyīn Typist was developed to provide the quickest, easiest, most natural, most fun, and most beautifully iOS-native way to type exactly the Pīnyīn you want, with proper diacritical tone marks, on the iPad, the iPhone, and the iPod touch. It turns typing Pīnyīn from a pain into a pleasure. 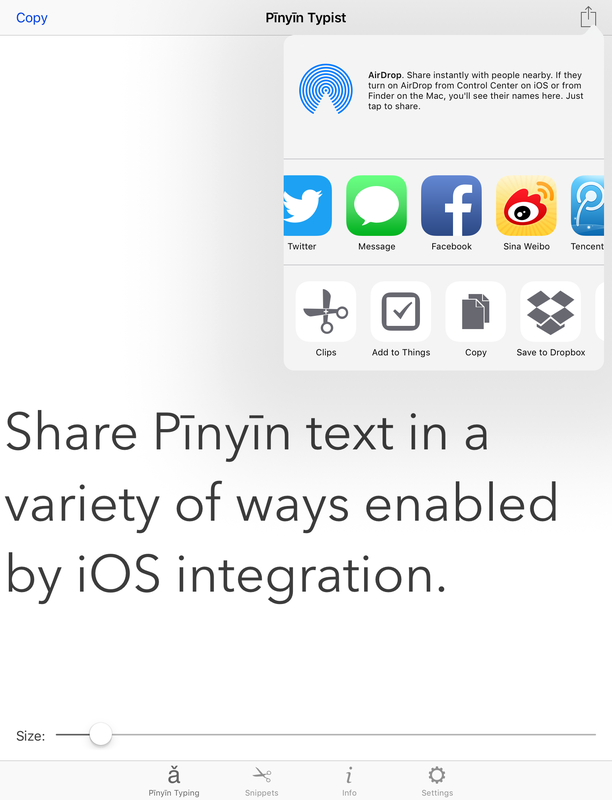 share it in the various ways enabled by iOS, including Messages, AirDrop, Twitter, Facebook, Sina Weibo, and Tencent Weibo. Note: Pīnyīn Typist can also be used to type Cantonese Yale romanization, as explained below. Pīnyīn is the official standard of the People’s Republic of China, Taiwan, the UN, and the ISO for using the Latin alphabet to write Mandarin Chinese. The Pīnyīn system was developed in China by Chinese people, so it is a product of Chinese culture, and it is a part of Chinese culture. While Pīnyīn works well as a pronunciation aid, that’s not all it is—like Chinese Braille (which is based on Pīnyīn), Pīnyīn in fact linguistically qualifies as and works well as a full writing system for Mandarin. A Sumerian proverb stated, “a scribe whose hand matches the mouth, he is indeed a scribe”, and Pīnyīn can indeed be used to write anything that can be spoken in Modern Standard Mandarin. So, it qualifies as a full writing system for Modern Standard Mandarin in this fundamental sense, for example. That Pīnyīn is a full writing system for any and all Modern Standard Mandarin speech means that, in addition to it being correct to say that “Pīnyīn is Chinese” because it was developed in China by Chinese people, it is also quite correct to say that “Pīnyīn is Chinese” in the sense that, even if it isn’t Hànzì (Chinese characters), Pīnyīn is indeed written Mandarin Chinese—it’s not as if Pīnyīn were written English or French or something. Also, since Pīnyīn is not just a pronunciation aid, but a full writing system, it is not “training wheels”—it’s regular wheels. In contrast, Chinese characters are like non-round wheels—more difficult than necessary. While some may find non-round wheels “interesting”, or maybe even beautiful, much of the time we just need to get from point A to point B as quickly and easily as possible. At times, we may even need to do so to save someone’s life! We can note, for example, that ambulances generally use wheels that are quite round. Similarly, Pīnyīn can help precious communication to flow without unnecessary difficulty. Practically speaking, we should keep in mind that, as many have found, by investing the minimal amount of time and effort needed to learn and get used to the Pīnyīn system, we will be equipped to always be able to quickly and easily read anything in Mandarin that’s written in Pīnyīn, and we will always be able to quickly and easily write anything in Mandarin using Pīnyīn. In contrast, even those who are fairly familiar with Chinese characters will at times come across unfamiliar or forgotten characters whose meanings and pronunciations they can only guess at. Also, even those who are fairly familiar with Chinese characters will at times be completely unable to remember or figure out how to write a certain character. Keep in mind also that since, as mentioned above, Pīnyīn is a product of Chinese culture, using Pīnyīn is not an imposition of Western culture—it is an application of Chinese culture! In fact, the Chinese developers of Pīnyīn of their own free will purposely chose to base it on the international Latin alphabet (it’s not just the English alphabet) so that users of Pīnyīn would benefit from its familiarity. The experiences of many, Chinese and non-Chinese alike, have shown that they were right to do so. “One of the basic assumptions of modern linguistics [the scientific study of language]…is that speech is primary and writing is secondary”. Yes, speech is the foundation on which writing must be built, not vice-versa. (That is just a natural result of the way we are made—our bodies have the built-in ability to produce speech, but writing requires external aids such as pens and paper, keyboards and screens, etc.) Thus, it is very good that the Pīnyīn writing system represents Mandarin speech so straightforwardly and easily, and that it enables us to focus on speech. Yes, while Chinese characters, as beautiful and traditional as they are, demand distractingly large commitments of precious time and energy just for themselves, the Pīnyīn writing system frees and empowers us to focus on communicating in Mandarin. Communication, after all, is the main and most important purpose of language, and it is the lifeblood of good relationships. —Lin Ai of 中网 Zhongweb Chinese, here, here, and here. Note: Pīnyīn Typist can be used this way to type Cantonese Yale romanization, as explained below. Pīnyīn Typist automatically puts the tone marks over the right vowels for you! If you tap the wrong tone button by mistake, causing the wrong tone mark to be added, then just tap the correct tone button while the insertion point is still where it was. The wrong tone mark will then be replaced by the correct tone mark. Pīnyīn Typist can convert both lowercase and uppercase vowels, and it has dedicated Ü, ‐ (hyphen), and ’ (apostrophe) buttons that are all on the main screen—no waiting or extra taps are needed to access them. All the Pīnyīn Typist toolbar buttons enter typographically correct Unicode characters. 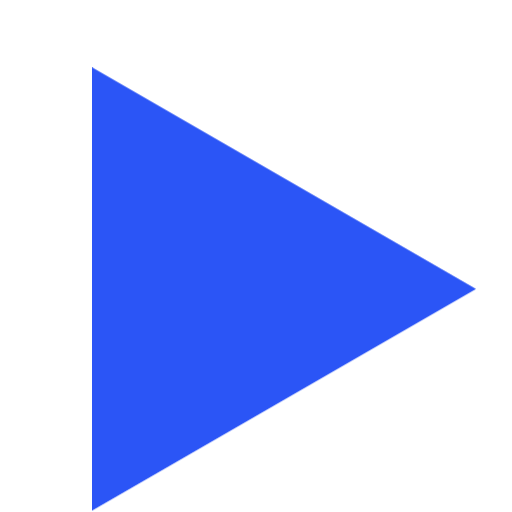 The ‐ (hyphen) button enters Unicode character U+2010 (HYPHEN). If this character isn’t supported by the font used where you paste text copied from Pīnyīn Typist, just use the hyphen-minus character typed with the regular keyboard instead. The ’ (apostrophe) button enters Unicode character U+2019 (RIGHT SINGLE QUOTATION MARK). According to the Unicode standard, this is the preferred character to use for an apostrophe. tap the tone button above the regular keyboard for the tone you want. If a hardware keyboard is connected, the onscreen keyboard does not appear during typing, so at such times the Pīnyīn tone buttons simply appear at the very bottom of the display and continue to work normally. If you place your iPad, iPhone, or iPod touch just above or in front of your hardware keyboard, the onscreen Pīnyīn tone buttons will be fairly close by, not much farther for your fingers to reach than the upper row of number keys on your hardware keyboard. Pīnyīn Typist can be used in both portrait and landscape orientations. The default theme text has been optimized to look better and smoother on non-Retina displays. The size of the text in the Pīnyīn Typing tab view can be quickly and easily adjusted with a slider. This can make it easier to read, either for yourself or for someone else to whom you want to show it. This ability is especially important considering how small the Pīnyīn diacritical tone marks are. Teachers and others can use this feature along with video mirroring or AirPlay Mirroring to use a television or a projector to show custom Pīnyīn text to an entire roomful of people at once, while making sure they can make out the Pīnyīn tone marks clearly. 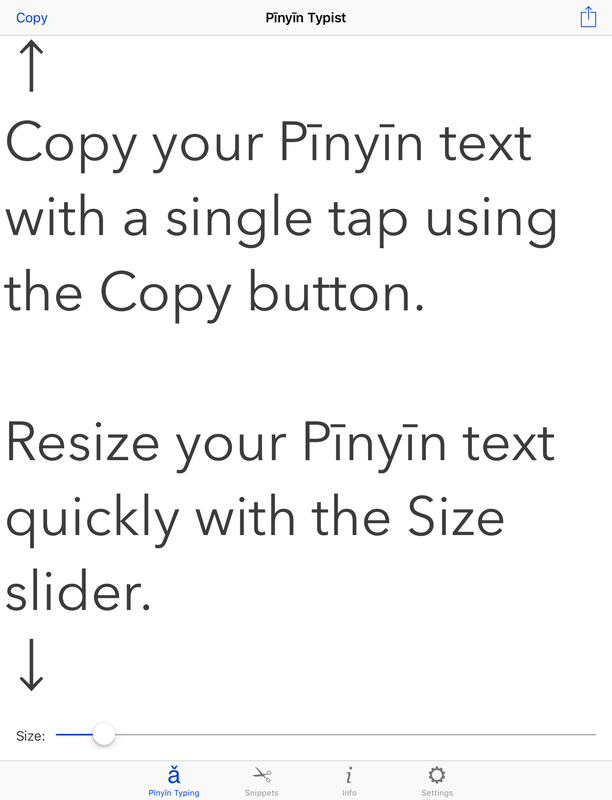 All the text in the Pīnyīn Typing tab view can be copied to the clipboard at the touch of a button, or portions of it can be selected and copied to the clipboard in the standard iOS way. The copied text can then be pasted into any app that supports the standard iOS method for pasting text, such as Skype, Twitter, Messages (with iMessage), Pages, Byword, etc. At the touch of another button, all the text in the Pīnyīn Typing tab view can be inserted directly into an email. When running on iOS 5 or above, a button is available for tweeting the text in the Pīnyīn Typing tab view. iOS’s international keyboards, including the Chinese ones, can still be used in the usual iOS way. 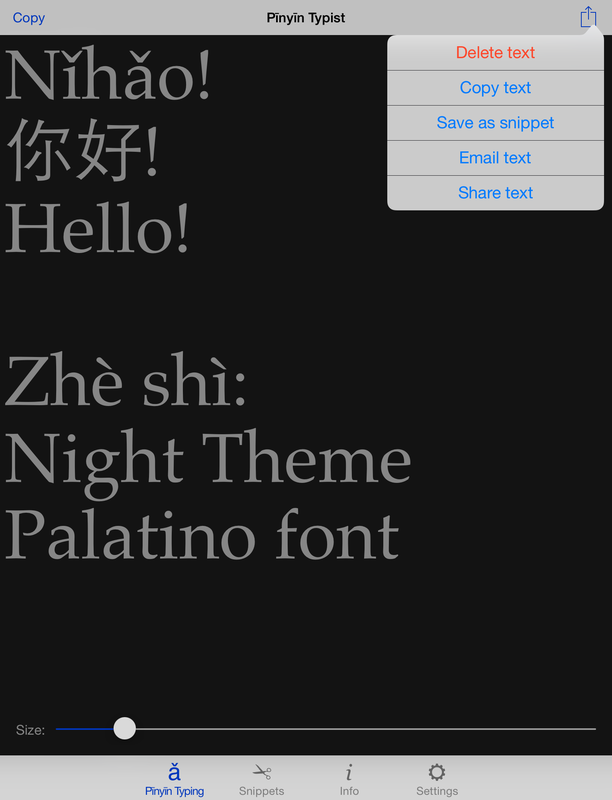 Thus, Simplified or Traditional Chinese characters and text of other languages supported by iOS (English, Spanish, etc.) can be entered in the Pīnyīn Typing tab view along with your Pīnyīn text. The text in the Pīnyīn Typing tab view can be saved as a snippet for future use, with a title that you can choose. When a snippet is reloaded into the Pīnyīn Typing tab view, its text size is restored along with its text. The text of a snippet can be copied to the clipboard, and its title and its text can be shared via HTML email. Also, when running on iOS 5 or above, the text of a snippet can be tweeted. A quick way to load a snippet into the Pīnyīn Typing tab view is to double tap it in the Snippets tab view. You can set the Night Theme, which changes the text and background colours to be easier on the eyes, especially at night. 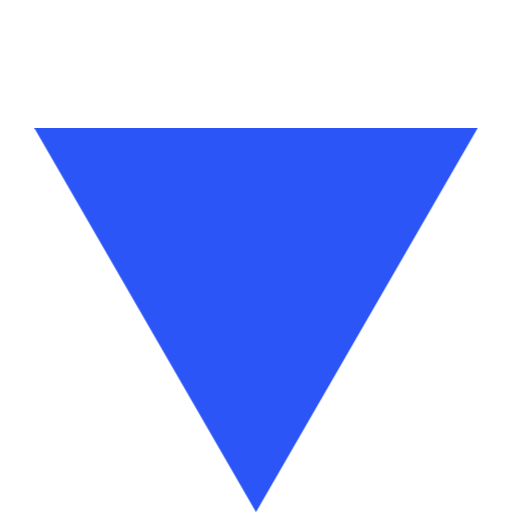 You can select whether you will receive a warning before loading a snippet, that loading a snippet deletes the text in the Pīnyīn Typing tab view and replaces it with the snippet’s text. You can select a different font for the Pīnyīn Typing tab view, for those times when you want to explore beyond the default font. All font choices have been tested to ensure the proper rendition of the Pīnyīn vowels before being made available. When you switch from Pīnyīn Typist to another app, and later switch back to Pīnyīn Typist, you can pick up right where you left off. Even if it gets shut down, Pīnyīn Typist remembers what you were working on in the Pīnyīn Typing tab view and restores it the next time it is started. Even the text size is restored. In Pīnyīn Typist’s Pīnyīn Typing tab view, type Pīnyīn text along with whatever other text you want to type using iOS’s international keyboards, incorporating HTML and/or CSS formatting code where you want formatting to be. Then, tap the button at the top right and select Email text. The HTML and/or CSS formatting code will be rendered in the resulting HTML email. 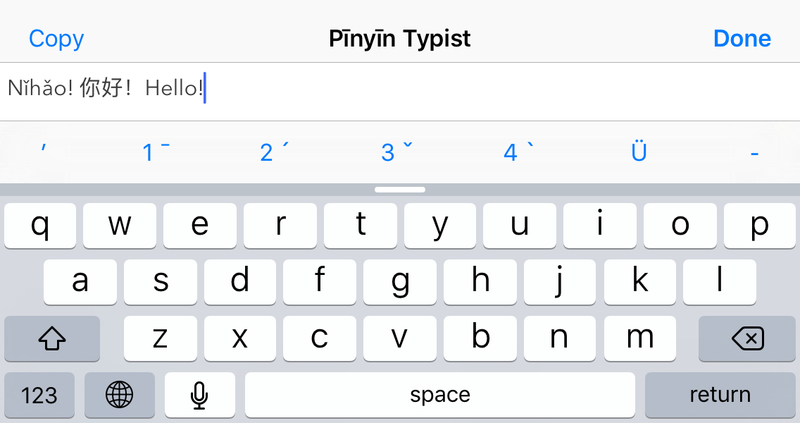 In Pīnyīn Typist’s Pīnyīn Typing tab view, type Pīnyīn text along with whatever other text you want to type using iOS’s international keyboards, incorporating Markdown formatting code where you want formatting to be. Thus, you can indicate formatting as you write, instead of having to remember where you want formatting to be and then adding it manually later in another app, like Pages. Copy what you typed in the above step to the clipboard, perhaps using the convenient Copy button at the top left. Paste it in an app that supports Markdown, e.g. Byword. If you paste the text to Byword, you can preview the Markdown code output there. You can also use Byword’s Export feature to produce an equivalent HTML file (in other words, an equivalent web page). You can then take that HTML file (web page) and view it in a web browser or in a web view in an app like GoodReader. You can also convert that HTML file’s output into a PDF file, print it out on paper, etc. 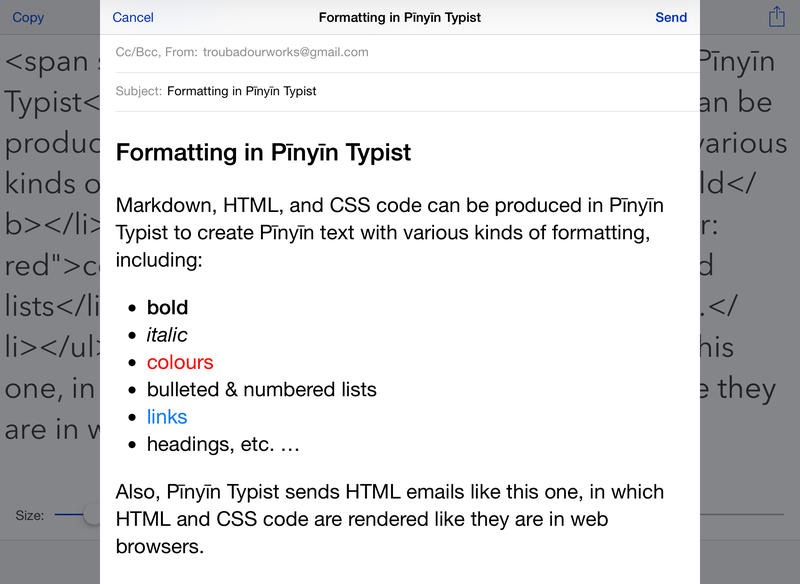 The formatting you indicated with the Markdown code you incorporated in Pīnyīn Typist will be rendered. As a universal app, Pīnyīn Typist is a single binary that is optimized for your iPad, and also optimized for your iPhone or iPod touch. Educational institutions can get a 50% discount off the price of Pīnyīn Typist in quantities of 20 or more. For more information, go to Apple’s Volume Purchase Program page. However, since app developers have no way of replying to App Store reviews, please email feedback and support questions to support@troubadourworks.com.